FILE - Egyptian actor Gamil Ratib is helped by a relative as he attends Omar Sharif's burial at the El Shafie Cemetery in Cairo, Egypt, Sunday, July 12, 2015. 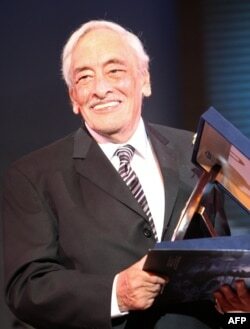 Award-winning Egyptian-French actor Gamil Ratib died Wednesday in Cairo. He was 92. Ratib is widely considered one of the greatest Egyptian movie actors of all time because of his screen presence and personal style. He acted in French and Egyptian movies, including David Lean's 1962 epic "Lawrence of Arabia" with Anthony Quinn and Omar Sharif, and Carol Reed's 1956 movie "Trapeze" with Gina Lollobrigida, Burt Lancaster, and Tony Curtis. Ratib once said on an Egyptian television show that he was a very good friend of Quinn, that the late American movie star helped him several times to find a job in the movie industry. He later became an icon of cinema and theater. 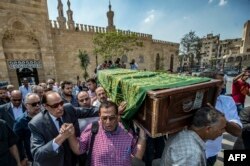 Ashraf Zaki (2nd-L), head of the Egyptian actors syndicate, along with veteran Egyptian actor Ezzat al-Alayli (3rd-L), walk with relatives and friends carrying the coffin of French Egyptian veteran actor Gamil Ratib during his funeral as they exit Al-Azhar mosque in the Islamic quarter of the capital Cairo, on September 19, 2018. Ratib was one of Egypt's top-grossing movie stars, performing in many films in a career spanning 65 years. FILE - Egyptian actor Gamil Ratib arrives for the closing ceremony of the 27th Carthage Film Festival on November 5, 2016, in the Tunisian capital Tunis. He was honored several times in film festivals and picked up many awards, including the French Legion d’Honneur, the highest French order of merit for military and civil merits. Ratib was born in Cairo, Egypt, in November 1926. He studied law and arts in France and performed in several French plays. In the early 1950s, Ratib joined "La Comédie-Française," one of the oldest theaters in the world. Egyptian actor Gamil Ratib holds his honorary award during the opening ceremony of the Alexandria Film Festival for Mediterranean Countries in the Egyptian port city of Alexandria, late on September 14, 2010. He made his movie debut in 'I Am The East' in 1945. Later, he played leading roles in such films as Deuxième Bureau Contre Terroristes (1961), Réseau Secret (1967), L’Alphomega (1973), L'Étoile du Nord (1982), and Un été à La Goulette (1996). He lived between Paris and Cairo.